Vascular dementia is in the second place of the most common type of dementia after Alzheimer’s. It accounts for approximately 15% of cases [1,2]. It affects 1 to 4% of the population over 65 years of age, with the incidence of 1.5 - 39 cases per 1000 people per year and increas in older age groups [1,3-5]. Was demonstraed that in the vascular dementia there is a change in the white and gray matter of celebral cortex . This disease is manifested by cognitive impairment, which usually accompanies and sometimes precedes it, lowering control over emotional reactions, social behavior and motivation [7,8]. There are episodes of deterioration of executive functions and abstract thinking as well as mood disorders and personality disorders . Despite the fact, that depresion and apathy are especially apparent in the vascular dementia, the symptoms such as delusions and hallusinations are very rare . A 79-year-old retired butcher who was brought to the high secure forensic psychiatry unit after killing his wife using a sharp instrument. His medical problems included hypertension, coronary artery disease, persistent atrial fibrillation. For about last five years, he was treated by a geriatrician because of deficits in cognitive functions such as memory deficits, and received the diagnosis of vascular dementia. About three weeks before murder, he became somewhat sad, irritable and agitated, had difficulty to sleep at night, seemed to be confused and disoriented, was waiting for ‘Our Lady’ and saw the devil. There were also memory and behavioral abnormalities, personality changes in the form of attacks of anger, quarrels, thinking disorders, planning, and difficulty in performing basic tasks of everyday life. In addition, there was a lack of criticism and a return to the professional interest of the butcher’s profession, which he performed over 30 years. The behavior of the man raised the anxiety of his 80-year-old wife, so she turned for help to the children. The family decided to seek medical help. Man was examined by general pratitioner who recommended psychiatric and neuropsychiatric consultaions. Specialist examinations were scheduled for 9 days. During this period the symptoms intensified, the man prepared himself every day to go out to work and sharpened kitchen knives at home. One day, in the evening hours, he attacked his wife while sleeping with a knife, depriving her of life. The victim suffered a stab wound in the chest and a cut wound in the left inguinal area, which resulted in her death. The other numerous wounds arose after death while attempting to fragment the body. Man confessed to he murder. After killing, he was found wandering in a confused state, he was disoriented and stuporous. He could not identify the motives of his behavior, he repeated that he had to confuse the wife with the animal, the demolition he was working on. It seemed to him that he was at work in a slaughterhouse and had to carve animal carcasses. He added that he loved his wife very much, but she had been nervous for some time, but he did not want to deprive her of her life. He was brought to the forensic psychiatry unit for evaluation. On admission he was disoriented to time and place, his psychomotor activity was retarded, there was a decline in both memory and thinking. Then it was observed step-wise progression in cognitive deficits, deterioration in self-care, poor judgement, concrete thinking, dyscalculia, emotional lability, irritability, impaired ability to carry out motor activities, and urinary incontinence. In the Mini-Mental State Examination (MMSE) patient had 12 scores, which indicated severe cognitive impairment. On several occasions, he became lost, had considerable difficulty finding words, eating, was talking with himself, and required assistance in shaving and dressing. The nurses’ notes from the late shift indicated that the patient became agitated and restless, although at times during the evening he was also noted to be disoriented and stuporous, he saw “something scary”. A computed tomography (CT) scan revealed the presence of cortical and subcortical atrophy, multiple infarctions involving cortex and underlying white matter. It was also found renal cell carcinoma with two metastases to the lungs (70x64 mm in right and 63 mm in left lung) with accompanying inflammatory state (Figure 1). The step-wise progression in dementia state, CT, and temporal relationship between worse general medical condition state (including exacerbation of hypertension, coronary artery disease, atrial fibrillation, and renal cell carcinoma with metastases) and onset of behavioral changes led us to suspect the role of focal and diffuse cerebrovascular disease and worse general medical condition state in the etiology of dementia, delirious states and perpetrated homicide. He was finally diagnosed as having a mixed cortical and subcortical vascular dementia with superimposed delirium . Delirium is an acute neuropsychiatric disorder characterized by failure of cognition and attention  (Figure 2). Delirium may be caused by infection such as pneumonia or drug (anticholinergics,benzodiazepines and opioids) . Figure 1: Computed tomography (CT) scan. 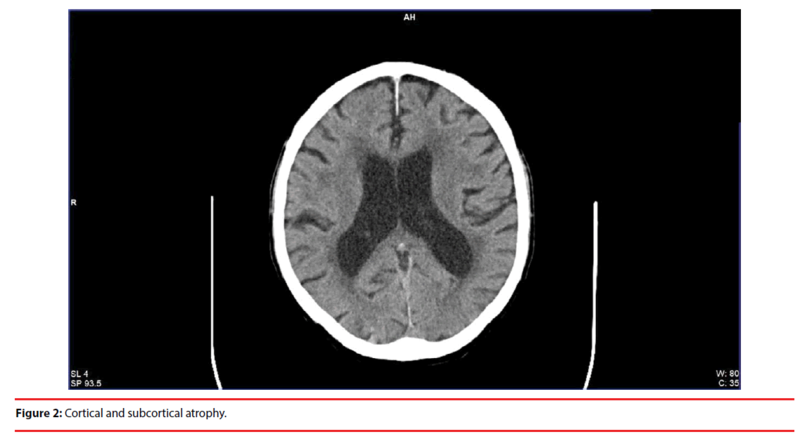 Figure 2: Cortical and subcortical atrophy. In the literature are many descriptions of vascular dementia. However there are only a few presentations of vasular dementia with superimposed delirium. It is considered to the most importat murder motive’s role in this case plays a profession previously practiced. Moreover, the direct neurocognitive cause is a significant activity of procedural memory. An interesting point of cognitive problems seems to be involved in abovementioned homicide is increased activity of procedural memory during the delirium state, that was directly associated with body defregmentation. Procedural memory is a type of implicit (unconscious) memory, characterized as long-term memory, which aids the performance of particular types of tasks without conscious awareness of these previous experiences such as those for riding bicycle, typing, reading words, etc. Neuroimaging studies found that motor-type procedural memory is situated in multiple brain regions, including the basal ganglia, cerebellum and the frontal and parietal lobes . Changes in the CT in our patient might be complicated with other types of dementia or mental diseases other than vascular dementia. Cortical and subcortical atrophy are observed also in patients with Alzheimer disease, Parkinson’s disease and vascular dementia of Binswanger type (Figure 2) [14-16]. In this case, the worsening symptoms of vascular dementia coexisting with delirium were the basis for the deterioration of matrimonial relations and ultimately the deprivation of life of one of the spouses. Korean scientists  conducted a study in persons in a court hospital where they identified cases of dementia of different aetiology. Of the 752 cases, only 7 were men with dementia. Moreover only 1 case of vasodilatation was diagnosed in man, 2 cases of dementia on Alzheimer’s disease and 4 cases of dementia associated with alcohol abuse. All the criminals were exposed to alcohol . In turn Aggressive behavior in geriatric patients was a problem of study conducted by Somes et al. Authors focused on methods of controlling the aggression of the elder patients. They proved that the problem is not isolated and rare. Our case showed the very important role of activity of procedural memory during the delirium state, which was directly associated with type of murder. Opala G, Ochudło S. Vascular dementia - clinical picture and differentia diagnosis. Udar. mózgu 6(1), 7-16 (2004). O’Brien JT, Thomas A. Non-Alzheimer’s dementia 3. Lancet 386(1), 1698-1706 (2015). Qiu C, Skoog I, Fratiglioni L. Occurrence and determinants of vascular cognitive impairment. Vascular Cognitive Impairment. Martin Dunitz, London 61-83 2002. Series H, Esiri M. Vascular dementia: a pragmatic review. Adv. Psychiatr. Treat 18(5), 372-380 (2012). McVeigh C, Passmore P. Vascular dementia: prevention and treatment. Clin. Interv. Aging 1(3), 229-235 (2006). Ylikoski R, Jokinen H, Andersen P, et al. and the LADIS Study Group. Comparison of the Alzheimer’s Disease Assessment Scale Cognitive Subscale and the Vascular Dementia Assessment Scale in differentiating elderly individuals with different degrees of white matter changes. The LADIS Study. Dement. Geriatr. Cogn. Disord 24(1), 73-81 (2007). Brakchine S, Lacombiez L, Pallison R, et al. Relationship between primitive reflexes, extrapyramidal signd, reflexive apraxia, and severity of cognitive impairment in dementia of the Alzheimer type. Acta. Neurol. Scand 79(1), 38-46 1989. Wragg RE, Jeste DV. Overview of depression and psychosis in Alzheimer’s disease. Am. J. Psychiatry, 146(1), 577-587 (1989). Roman GC, Royall DR. Executive control function: a rational basis for the diagnosis of vascular dementia. Alzheimer Dis. Assoc. Disord. 13 (Suppl 3): 369-380. Lyketsos CG, Lopez O, Jones B, et al. Prevalence of neuropsychiatric symptoms in dementia and mild cognitive impairment: results from the cardiovascular health study. JAMA 288(1), 1475-1483 (2002). Fong TG, Tulebaev SR, Inouye SK. Delirium in elderly adults: diagnosis, prevention and treatment. Nature. Reviews. Neurology 5(4), 210-20 (2009). Clegg A, Young JB. Which medications to avoid in people at risk of delirium: a systematic review. Age. Ageing 40(1), 23-29 (2011). Mochizuki-Kawai H. Neural basis of procedural memory. Brain. Nerve 60(7), 825-832 (2008). Štěpán-Buksakowska I, Szabó N, Hořínek D, et al. Cortical and subcortical atrophy in Alzheimerdisease: parallel atrophy of thalamus and hippocampus. Alzheimer. Dis. Assoc. Disord Jan- 28(1), 65-72 (2014). Zhang Y, Zhang J, Xu J, et al. Cortical gyrification reductions and subcortical atrophy in Parkinson's disease. Mov. Disord 29(1), 122-126 (2014). Jung WB, Mun CW, Kim YH, et al. Cortical atrophy, reduced integrity of white matter and cognitive impairment insubcortical vascular dementia of Binswanger type. Psychiatry Clin Neurosci 68(12), 821-832 (2014). Kim JM, Chu K, Jung KH, et al. Criminal manifestations of dementia patients: report from the national forensic hospital. Dement. Geriatr. Cogn. Dis. Extra 1(1), 433-438 (2011). Somes J, Donatelli NS, Kuhn S. Controlling aggressive behavior in the geriatric patient. J. Emerg. Nurs 37(3), 275-277 (2011).